The United States: How will the latest tariff increases impact consumer inflation? 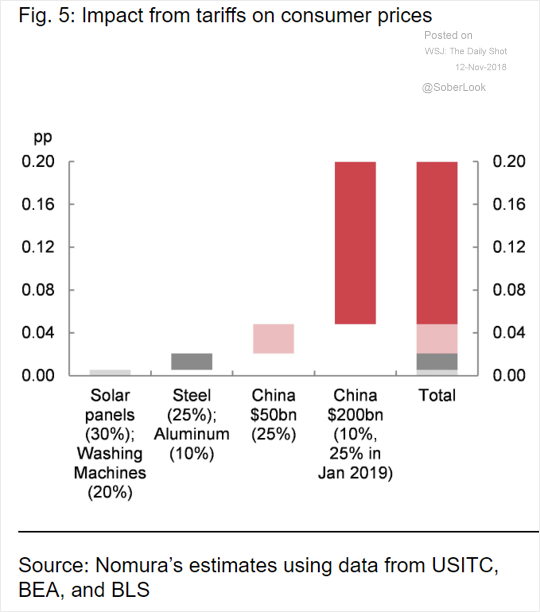 China: The latest increase in China’s exports was driven by US firms “frontloading” orders ahead of tariffs. 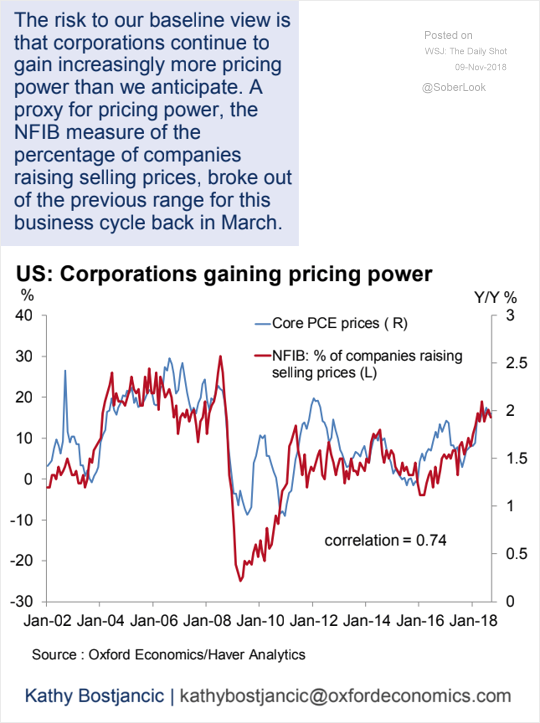 The United States: Will improved pricing power in the corporate sector result in an upside inflation surprise? China: The percentage of Chinese bonds held by foreigners keeps climbing. 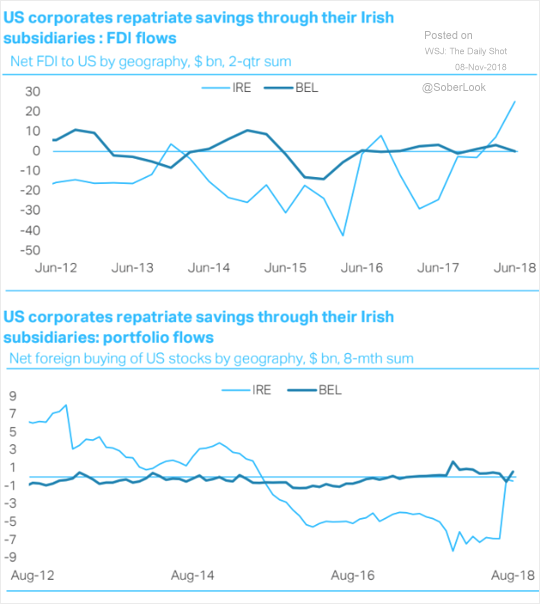 The United States: US multinationals have been repatriating cash from Ireland. Asia-Pacific: New Zealand’s bond yields are still climbing. 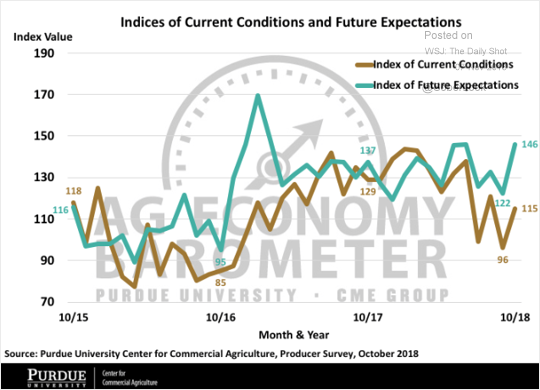 The United States: The US agricultural sentiment index (Ag Economy Barometer) improved in October on hopes that the NAFTA 2.0 deal will ease trade tensions. China:Goldman’s money-supply indicator for China has diverged from the nation’s credit growth. 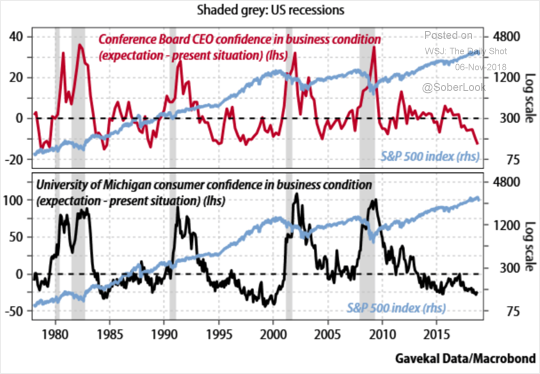 The United States: This chart shows the difference between CEOs’ future expectations and their assessment of the present situation. The second chart has the same measure for the consumer. China: The Caixin/Markit Composite PMI (manufacturing + services) is approaching 50 (business activity growth is stalling). The United States: This chart shows US household formation over time (renters vs. homeowners). 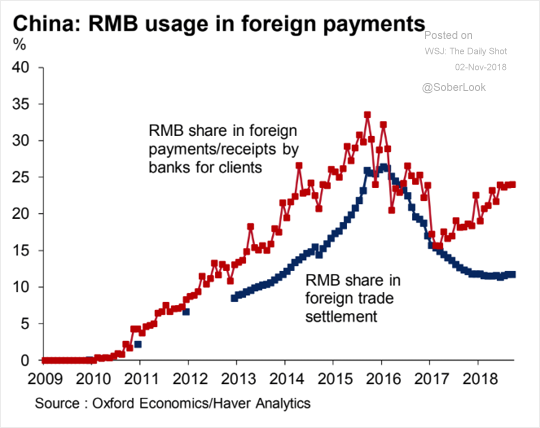 China: This chart shows the RMB (yuan) usage in foreign payments. 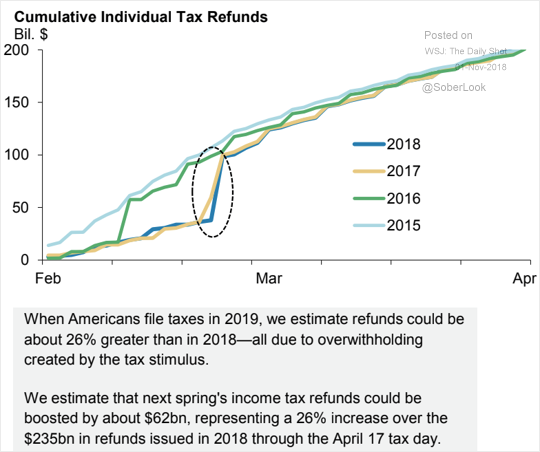 The United States: Americans should expect a bump in tax refunds next year (see Morgan Stanley’s comments below). China: This chart shows how Beijing has been “guiding” the housing market. 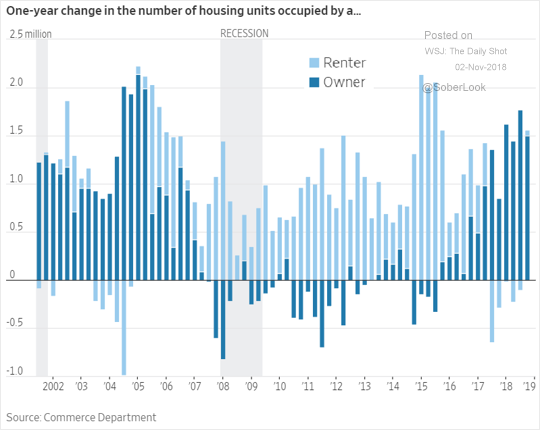 Do the current levels suggest that housing policy tightening is coming? 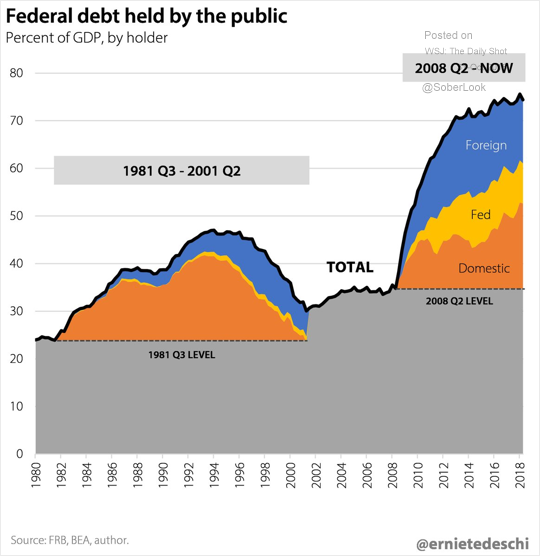 The United States: Finally, the chart below shows how different the run-up in federal debt was in the 1980s vs. over the past decade. China: Will stronger fixed asset investment offset some of the weakness in manufacturing exports? 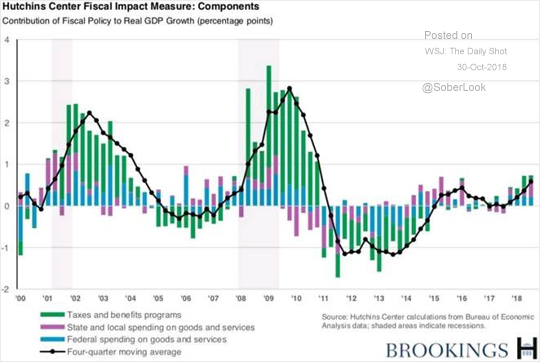 The United States: This chart shows the government’s contribution to the GDP growth (federal, state and local). 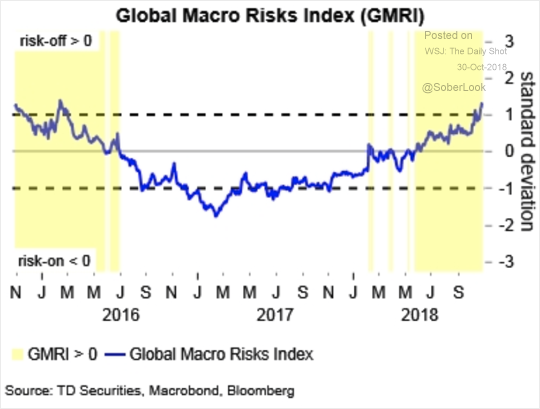 Global Developments: Here is TD’s global macro risks index. China: The Q4 GDP growth is shaping up to be disappointing (as tariffs hit). 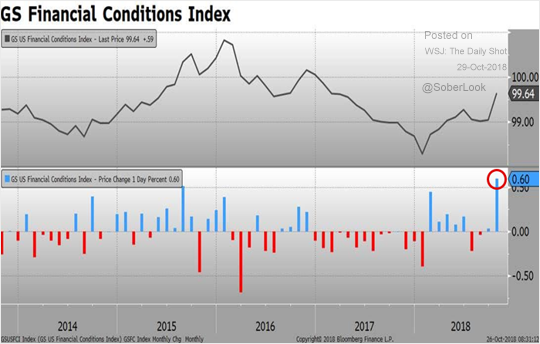 The United States: The recent tightening in financial conditions has been unusually sharp. Global Developments: Tighter financial conditions should further slow growth in advanced economies. 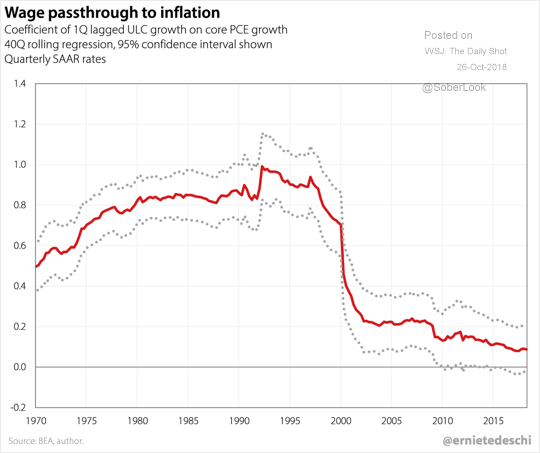 The United States: Do rising wages boost inflation? The link is now much weaker than in the past. 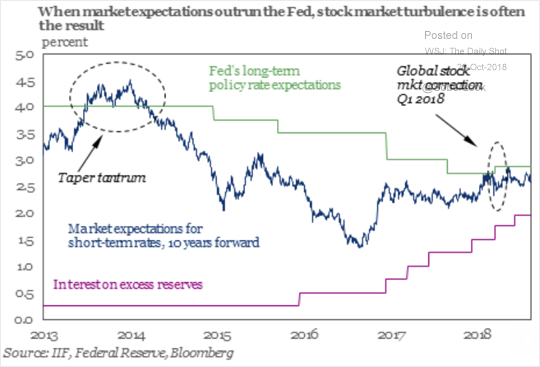 Global Developments: When markets’ long-term expectations of rates meet the Fed’s long-term policy rate projections, stock market volatility ensues. China: Inflows into China’s domestic bond markets have slowed sharply. 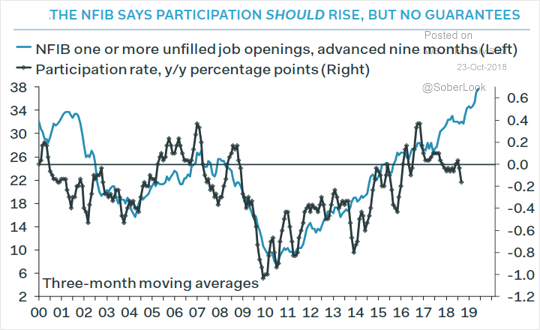 The United States: According to the NFIB’s small business survey, the US labor force participation rate should improve going forward. Global Developments: How have the stock markets around the world reacted to negative and positive trade war news?